Not knowing what to do, I sat on the church steps and waited. As the gravity of my failure began to well up in me, I began to cry... I had lost the hearse! Of course, sometimes tradition gets thrown under the bus. From a dysfunctional family who turn their mother's wake into a full-blown riot, to funeral crashers looking for free meals, to a horse-drawn hearse taking the dearly departed for the ride of their afterlife, these accounts from actual undertakers will have you laughing, thinking, and gasping in disbelief. A literal graveyard of wild coincidences, slapstick humor, and touching moments, Over Our Dead Bodies explores the lighter side of the dead, the living, and the lone undertaker who has to make it all go as planned - even if it doesn't. ©2014 Kenneth McKenzie and Todd Harra (P)2014 Audible Inc.
Good, but not for everyone. 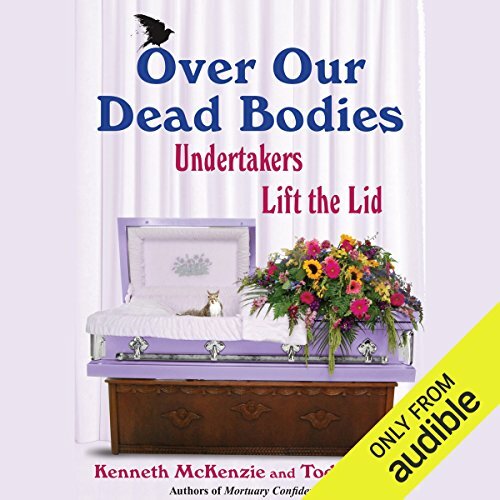 Would you consider the audio edition of Over Our Dead Bodies to be better than the print version? I cannot say, but I really enjoyed listening to it. The best thing about this book is the stories submitted by other members of the profession. I really like how multiple narrators told the story. I laughed aloud several times, and cried once, this book has a range. There are several sections where the authors talk about daily life as an undertakes, while most of these are interesting, one of the authors gets to talking about his TV personality and charity work, which pertains more to him than the profession, and is a little self glorifying, Obviously the stories are a hoot. Amazing just like Mortuary Confedintal!!! I couldn't put it down... only took me a few days to listen to!!! Its drives my passion of becoming a funeral director!!!!! What would have made Over Our Dead Bodies better? What was most disappointing about Kenneth McKenzie and Todd Harra ’s story? Much like Mortuary Confidential, this book retold interesting tales from the light side of the funeral home. All in good spirit, I enjoyed listening with laughter and smiles and tears at times. Great job authors!